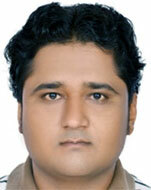 Mr. Mukesh Kumar Meghwar originally hails from Kapri Mori in Badin Sindh. He was born on April 4 1988. He received his Primary and secondary education from his village Haji Abdullah Halepot, Mr. Mukesh is a proud son of a cobbler (Mochi) and he use to sweeping in a school for continues his studies, Mukesh is the first person from his family to seek higher education. Currently, he is studying law and also did his BS Psychology from the Sindh University in Jamshoro. In 2014 Mukesh was selected in a highly competitive US Exchange program Fellowship "ELP" Emerging Leaders of Pakistan in USA, in that batch of fifteen young leaders, Mukesh was the only one from the interior Sindh. Currently, he is elected as a Secretary for Interfaith Harmony of National Party; he also serves as the deputy general secretary of "Progressive Youth Forum" (PYF) Pakistan, a political forum of young men and women striving to promote social democracy, secularism, and pluralism. With the support of his friend Harji Lal, he cofounded the first ever Hindu-rights based newspaper called Sandesh (meaning "the message") to highlight the issues and discrimination faced by Hindus in Sindh. The paper is playing a big role in bringing issues from his minority community to the forefront in Pakistan's mainstream media. Mr. Mukesh is a founding member of Social Democratic Youth Network (SDYN) Pakistan and is also on the board of directors of uElect Pakistan, a voter education campaign. Mr. Mukesh also works to highlight issues related to the misuse of Pakistan's blasphemy law. Previously, Mr. Mukesh worked as a regional coordinator with Mehergarh: A Center for Learning at its regional office in Hyderabad from 2008 to 2012, where he acquired experience in the development, implementation, monitoring, and evaluation of national and regional programs. Politically, Mukesh Kumar is affiliated with Blue Party and Member of Standing Committee on Political and Electoral System.